Arnold Schwarzenegger watches from Audemars Piguet are imposing, rare, and highly coveted. These chronographs belong to the Royal Oak Offshore series, are up to 48 mm in diameter, and honor the former Terminator. Large, difficult to find, and masterfully crafted – these are the Arnold Schwarzenegger watches from Audemars Piguet. The Swiss watch manufacturer has released several limited editions in honor of the world-famous actor and ex-politician. Most are a part of the Royal Oak Offshore sports watch collection. The main features of these timepieces are their massive cases and wide octagonal bezels with eight perfectly aligned hexagonal screws. Case diameters of up to 48 mm are par for the course in this series. Both high-tech materials, such as titanium or ceramic, as well as steel or rose gold are used for the cases. As a whole, the design resembles that of a porthole. This look is a trademark of the Audemars Piguet Royal Oak, an icon in the history of watchmaking. How much does an Arnold Schwarzenegger watch cost? The Legacy watch is one of the newer watches to carry Arnold Schwarzenegger's name. The full name of the timepiece is the Audemars Piguet Royal Oak Offshore Arnold Schwarzenegger The Legacy Chronograph. Its reference number is almost as long as its name: 26378IO.OO.A001KE.01. You can purchase the Arnold Schwarzenegger The Legacy for around 33,600 USD pre-owned. Due to the extremely limited numbers, never-worn examples are rare and more expensive. The 48-mm wristwatch is limited to a run of 1,500. With a thickness of 14.8 mm, this chronograph makes a bold statement on your wrist. When you look at the black dial, its rose gold Arabic numerals immediately catch your eye. The " méga tapisserie" pattern on the dial is also on the push-pieces controlling the chronograph. Like the hour markers, the push-pieces, hour hand, and minute hand are made of rose gold. Additionally, both hands glow in the dark. Audemars Piguet chose black ceramic for the case and bezel of this Schwarzenegger watch. The case back is made of titanium and is engraved with the model name. The screw-down crown ensures that the timepiece is water resistant to 100 m (10 bar, 328 ft). One highlight of The Legacy is its strap, which is made of aramid fibers, also known as Kevlar. This material is commonly used in bulletproof vests. The use of Kevlar makes the strap extremely robust, and sapphire glass protects the dial from damage. The automatic chronograph caliber 2326/2840 powers The Legacy. It has a 38-hour power reserve and vibrates at 28,800 A/h. There's a date display at 3 o'clock. In 2003, Terminator 3: Rise of the Machines was released, the third film in the Terminator series. Reprising his role from 20 years before, Schwarzenegger played the Terminator. In celebration of the film, Audemars Piguet introduced the Arnold Schwarzenegger Royal Oak Offshore T3. The special edition was limited to a run of 1,000 ; 750 of the watches had a black dial, and 250 had a white dial. 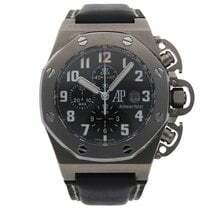 A pre-owned Arnold Schwarzenegger Royal Oak Offshore T3 with a black dial sells for around 31,100 USD. Plan to spend over 34,700 USD for a never-worn timepiece. The model with a white dial sits in a similar price range. However, this model may increase in value going forward considering its rarity. The Terminator Offshore has a titanium case and a protector over the push-pieces and crown. The case is 48 mm in diameter. At 16 mm thick, this chronograph isn't the thinnest available, but thanks to its titanium case, it's very lightweight. Since the case is water resistant to 100 m (10 bar, 328 ft), you can even go swimming with the Terminator Offshore. Scratch-resistant sapphire glass covers the dial, giving you a crystal-clear view. The dial is black and has a tapisserie pattern. A tachymeter scale is located on the edge of the dial, which you can use to determine speed. The black dial contrasts with the white Arabic numerals, and a leather strap with a pin buckle keeps the timepiece solidly on your wrist. The in-house caliber 2226/2840 powers the Royal Oak Offshore T3. It vibrates at a frequency of 28,800 A/h. The movement features a date display at three o'clock, a small seconds under 12 o'clock, a minute counter at nine o'clock, and an hour counter at six o'clock. It has a power reserve of 38 hours. 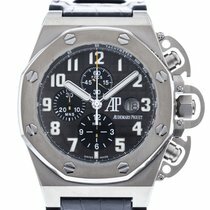 The Royal Oak Offshore End of Days is another Arnold Schwarzenegger watch from Audemars Piguet. It was introduced around the turn of the century in conjunction with the release of the film End of Days, starring Arnold Schwarzenegger. Due to the limited run of 500 watches, the market is made up almost exclusively pre-owned Royal Oak End of Days. In very good condition, one of these Schwarzenegger watches costs around 28,800 USD. With a diameter of 44 mm, the timepiece isn't as imposing as the other Schwarzenegger watches. Furthermore, the End of Days appears smaller due to its black-coated case , which means its suitable for mid-sized wrists as well. The dark Kevlar strap goes amazingly well with the black case, emphasizing the overall robust and sturdy look of the chronograph. Its neon yellow hands and Arabic numerals are striking and create a stark contrast against the black dial. Audemars Piguet also uses the caliber 2226/2840 for the End of Days. If you'd prefer a Schwarzenegger watch made of gold, then the Royal Oak Offshore Arnold's All-Stars is a perfect choice. This 48-mm chronograph has an 18-karat rose gold case. Audemars Piguet created this model in honor of Arnold Schwarzenegger's non-profit organization. Schwarzenegger founded the After-School All-Stars and even served as the chairman in the foundation's early years. This organization is dedicated to helping students find suitable careers after graduation. The price for a pre-owned Royal Oak Offshore Arnold's All-Stars in very good condition is around 60,400 USD. Watches in mint condition are extremely rare and cost a few thousand dollars more. The Royal Oak Offshore Arnold's All-Stars has a diameter of 48 mm and is limited to a run of 350, making it extremely rare. The rose gold Arabic numerals match the case, and the brown dial with its tapisserie pattern offers a harmonious contrast to the gold. Audemars Piguet pairs this watch with either a black or brown leather strap. 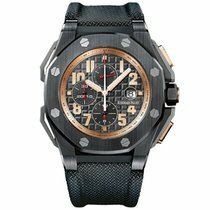 The Royal Oak Offshore Arnold's All-Stars is the most classic Schwarzenegger watch from Audemars Piguet. The Le Brassus-based manufacturer uses the caliber 3126/3840 to power this chronograph. Its balance wheel vibrates at a frequency of 21,600 A/h and has a power reserve of 50 hours. Which Arnold Schwarzenegger watch should I wear? Arnold Schwarzenegger watches were designed with men in mind. Their massive cases make them most suitable for larger wrists. If your wrist is a bit smaller, then consider the Royal Oak Offshore End of Days . With a diameter of 44 mm, this watch is suitable for most men. If you're not a bodybuilder or particularly large, you can still purchase a Schwarzenegger watch from Audemars Piguet. These limited edition watches are appealing to collectors and Schwarzenegger fans as well. You don't necessarily have to wear these Royal Oak Offshore watches – you can simply add them to your collection. Arnold Schwarzenegger's personal watch collection is rather large. The Austrian is well known for being a watch enthusiast. In 2015, together with the Brazilian company Magnum Group, Schwarzenegger presented his own watch brand. Its three collections were made up of gigantic watches with diameters up to 50 mm. Privately, and in the film Eraser, Schwarzenegger wears a Panerai Luminor, a diving watch with a distinctive crown protector. Previously, Schwarzenegger has also worn classic pilot's watches from the German company Laco. The Arnold Schwarzenegger watches were inspired by Audemars Piguet's Royal Oak timepiece. This watch revolutionized the watch market upon its release in the 1970s. It was the first stainless steel watch to cost more than a gold watch. Furthermore, the Royal Oak had a groundbreaking design. Gérald Genta, perhaps the most famous Swiss watch designer, designed the Royal Oak. It has a distinctive hexagonal bezel with visible screws and an integrated metal bracelet. Today, the Royal Oak is one of the most famous and sought-after watches in the world. You often have to wait months before buying a Royal Oak from a store. Therefore, fans of this watch are often willing to pay a bit more for a new Royal Oak online if it means they'll receive the watch sooner. Generally, this watch should maintain its value or even increase in value. A new stainless steel Royal Oak with reference number 15202ST costs around 28,900 USD.